I post this just to show a way to restore the center console. I´m in Spain and to get exchange parts over here is expensive because the transports fees. I began to restore the holes and cracks. The second was to do templates in cardboard. After to cut the leather I did glue it to the center console and sew it. He are some photos. I hope that idea helps if you are thinking on doing something similar. Very nice work! Makes the console look even more modern while keeping it true to its design. At one time i did have thoughts of doing the Javelin interior door panels and all in leather, but the Prestone car made me drop the idea. Now you have given another thought into it... mostly because I am not much of a seam person, with all the subtle features and angular details. You need a lot of time, and patience, plus knowlege of how to cover like a glove fit. Escpecially the console. With minor details asside, its almost a show piece. Great Job, very professional looking !!! In this way, the '71/4 Javelin is linked to '66 AMX Project IV cars by reason of it's contrast to Cavalier symmetrical design. ...so there's your non-symmetrical Javelin console, for the non-symmetrical interior. Congratulations; the leather work looks good. Thanks for your comments to all of you. 304- dude, It´s true that the job takes long time and some skills. Indeed I left it apart for a few months when I was working on it. I´ll say that if you are able to do de cardboard templates right you will be able to do the rest of it. For the template job you don´t need to do nothing that can not be undo, you can do a go and see who it goes. If you finally go for it let me know and I will give you some advice and tricks that could help you with the leather. I had to do the lower door panels in leather too, because a few years ago I had them done by a professional but was rubbish. He used heat to glue the leather and melt the plastic. 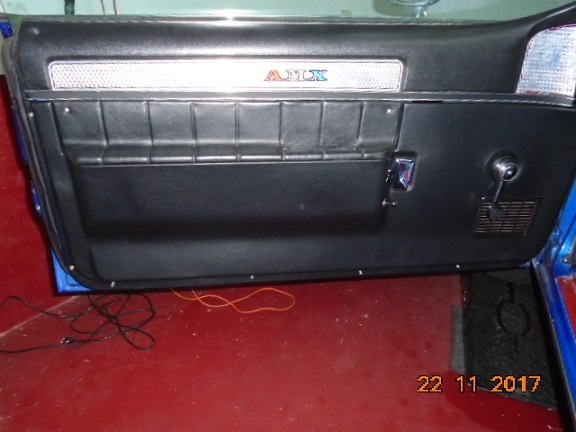 After a few uses of the window up and down the door panel was ruined because the handle had make a circle on the leather. I was able to work the plastic panel to its original shape and save the peace. The door panel is much easier to do than the console, no need of sew I will say that you must star for it. My panel has a little error on the bottom and left side you see a few screws that should not be there because they make contact with the rubber seal of the door. But I sow it to late to fix it . Thanks for the additional info... still contemplating myself. I have been careful with restoring the original earlier ABS console, which warped from interior heat and seat cushion pressure. Got it straight again, but the owner had used adhesive at one time. Nothing left but the hardened mess where the seat rubbed. Been slowly picking it away and hitting it with a propane torch to loosen at the edges. Its a very slow process if you dont want to damage the grain on the abs. Fortunately abs can take some flash heat better than the old hard and brittle adhesive. Already tried abs safe solvents, and none loosened the adhesive. Ps, you should try to get together with Santiago in Italy. The both of you can do magic on a car. What ever Santiago can visualize he creates very well. Keep up the good work, and maybe you might get around to correcting the door panel when you feel up to it, if your willing. thanks for the advice, I all rady know Santiago, but I´ll try to check Santiago´s work more often. Any time you need help just let me know.